ABC games for kids can teach children several things about the alphabet. Kids can learn the individual letters, the correct order of the letters, the corresponding capital and lowercase letters, the sound of each letter, and the words that can be created with each letter of the alphabet. A variety of strategies can be incorporated into ABC games for kids in order to teach these key concepts. Write the alphabet on a sentence strip. Cut the sentence strip into various parts, such as abcd, efgh, ijkl, mnop, qrst, uvw, xyz. 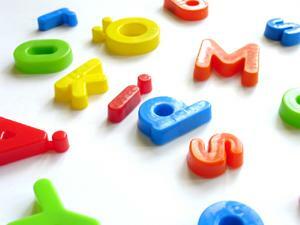 Have children put the various parts together to make the alphabet. The first person who can correctly put the parts of the alphabet in order wins. Write each letter of the alphabet on an index card. Scramble the index cards up. Have children put the alphabet in the correct order. The first person to finish wins. Place each letter on a card, and cut out various pictures. Match each picture to its beginning letter. For example, if you have pictures of a cat, cake, apple, and ant, ant and apple would be matched to the letter A, and cat and cake would be matched to the letter C. The first person who can match all the pictures to the corresponding letters wins. Create a bingo board with capital letters. Write out corresponding cards with the matching lower case letters. Begin showing children the lower case letter cards, and children can place their bingo chips over the corresponding capital letters. Place individual letters of the alphabet across the wall or floor. Choose five letters to take away. Give them to the children and ask them to place them back in their proper place. Make a folder using nine pocket sleeve protective sheets. Place each letter card from the alphabet in the pockets. Tell children to pull out letters and make a real word with them. For example, using the letter a, c, and t, the children can make the word cat. When they are finished, tell the children to place each letter card back into the pocket sleeves in alphabetical order. Make an outline of a picture using dots. Instead of numbers, write the letters of the alphabet by each dot. Have children connect the dots by matching the letters in the correct alphabetical order to draw the picture. Individually laminate alphabet letters and place a small magnet on the back of each. Make a fishing pole with a magnet on the end. Place all the letters in the bucket. Have children take turns throwing their fishing pole into the bucket and pulling out a letter. The children must correctly identify the letter and/or sound the letter makes in order to stay in the game. If the letter or sound is correctly identified, the children score and point and must keep the letter out of the bucket. If the children incorrectly identify a letter or sound, they must put the letter back in the bucket, and they do not score a point. The children with the most points at the end of the game will win. There are several ways to use ABC games for kids. The games are activities that can be used in the classroom or at home. ABC games for kids are entertaining ways to teach children the importance and various uses of the alphabet.